The Convergent Media Collective is proud to host: A look at the San Antonio Art Scene. 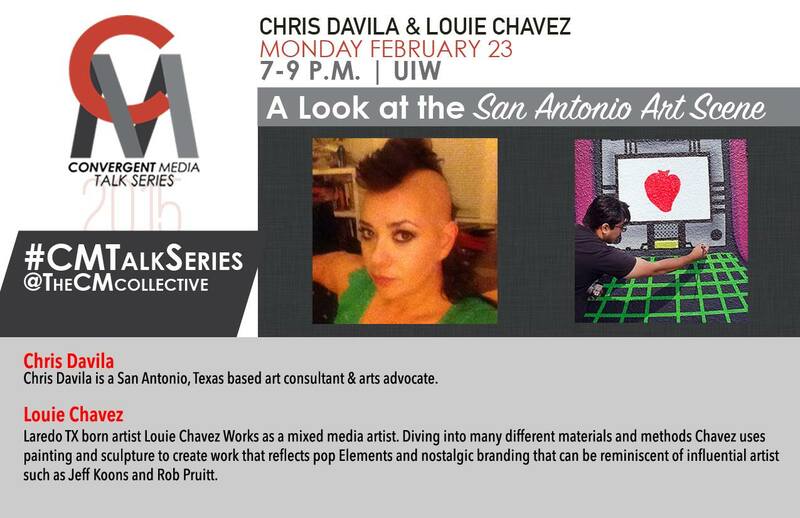 We have two guest speakers who are artists and curators in San Antonio, Tx. Both have unique stories as to how they have come to be part of the art scene. So please join us for a night of fun. Remember CMC talks are meant to be interactive and we encourage questions and dialog. Bio: Chris Davila is a San Antonio, Texas based art consultant and arts advocate. Title: SELF CREATION AS AN ARTIST. Description: To be a successful artist one must submit themselves to a lifestyle that often holds high emotional risk. Branding yourself and your art work involves criticism and praise that can be a roller-coaster of glory and self-doubt. My topic of discussion highlights times in life where I came into a city as an unknown and worked to establish a respect as an artist, but more importantly a self-assurance that the life I live is the artist life in every which way. Elements and nostalgic branding that can be reminiscent of influential artist such as Jeff Koons and Rob Pruitt. Reactions sought from the viewer are that on the surface the work with its bold colors and familiar characters can engage you into a positive mood and at the same time explore undertones of modern self-destructive habits.